I've heard it preached that this means that when you love God, He will give you what you want. I think we need to look a bit deeper. If we are "delighting" ourselves in the Lord, then our heart's desire is for Him and all things connected to Him: being in His presence; continual awareness of His living in us; ability to discern when He is speaking to us and also to know when it's the enemy or the flesh; spiritual maturity; to be used in His service; to be honored with chances to share Him with others, etc. Then the rest of the verse is in harmony - "He will give you the desires of your heart"! That would be true in two ways...He will give us these things of Him that we desire because we "delight" in Him, and also, He actually gave us these very desires when we "delighted" in Him! So...when we delight in Him, He first gives us these new desires in our heart and then promises to fulfill these desires! Awesome! And here's today's gift for you - enjoy! If you download, please leave me a comment at the bottom of this post as I have disabled 4shared comments. This helps me to know what you like for the future and please support this blog by shopping my PayPal store. God bless you! Very cool! I can think of plenty of usese for this. Thank you for sharing! This should be fun to use, thank you! 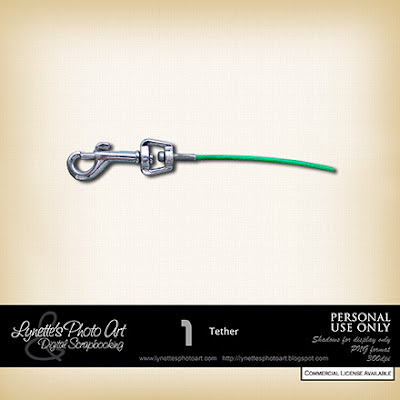 Thanks so much Lynette, I can definitely use this tether when I scrap some photos of our dogs. I also love the Rose of Sharon flower which you shared yesterday. How unique! Thanks muchly. And, since you are so clearly a woman of faith, could you please pray that our house would sell? It's been on the market for 2 years and the financial strain has about done us in. Thank you.